This is a Palomino Blackwing 602 pencil. Blackwing? Sounds like something out of Gothic horror or at least Batman. No. It’s an iconic writing instrument, the Mercedes-Benz of pencils. Not the original Blackwing 602s, manufactured by the Eberhard Faber Pencil Company. [Those of us half a century or older remember Faber pencils in grade school.] Those gems, which went out of production in 1989, can fetch upwards of $40.00 per pencil on eBay. 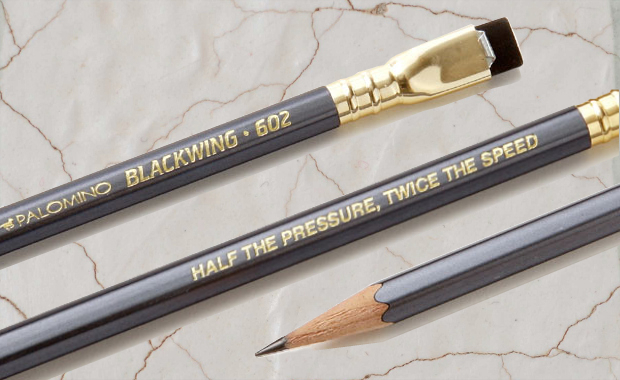 Years later, the Blackwing 602 brand was acquired by California Cedar Products Company which started making them again under their Palomino division. Purists still prefer the original Faber Blackwing 602s, but they are disappearing. And who wants to pay $40.00 for a pencil? The script on the barrel of the pencil says HALF THE PRESSURE, TWICE THE SPEED. There is something about the recipe of the 602’s graphite that gives the user a very smooth writing experience. I test drove one and compared it with a number of other pencils last Christmas. There is a difference. All pencils are not created equal. The flat, square and replaceable ferrule-encased eraser gives one the added bonus of an expensive pencil not rolling off the table and breaking the lead. At $22.95 for a dozen through Amazon.com, this is a big deal. Luminaries in many artistic fields have sworn by the Blackwing 602 for years. Writers (John Steinbeck, Vladimir Nabokov); Composers & Arrangers (Stephen Sondheim, Nelson Riddle, Johnny Mercer); Cartoonists (Chuck Jones). It’s even shown up on Mad Men! 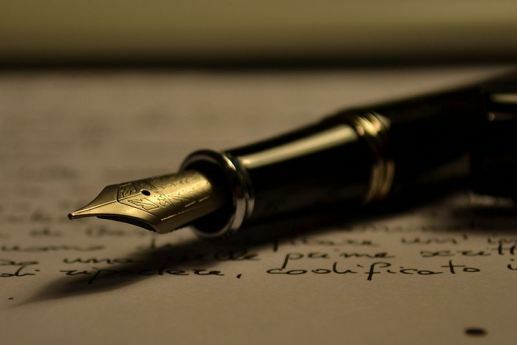 There is something wonderfully sensual about the experience of writing longhand, composing music, or sketching with a superior writing instrument. You can try this famous pencil for yourself. Be aware, these pencils are not easy to track down in most towns. You won’t find them in Staples or Office Max, unless they’ve begun selling them. They’re not carried in a lot of brick-and-mortar stores. However, you can find them here for about $2/each, including shipping. I never dreamed I’d consider a single pencil worth two bucks a piece but this one is. PS Buy the Blackwing sharpener and sharpen your 602s by hand. Never sharpen a Blackwing 602 with an electric sharpener! You’ll discover soon enough that not all sharpeners are designed well–well enough, that is, to get a long life out of your Blackwing 602. Here you are. 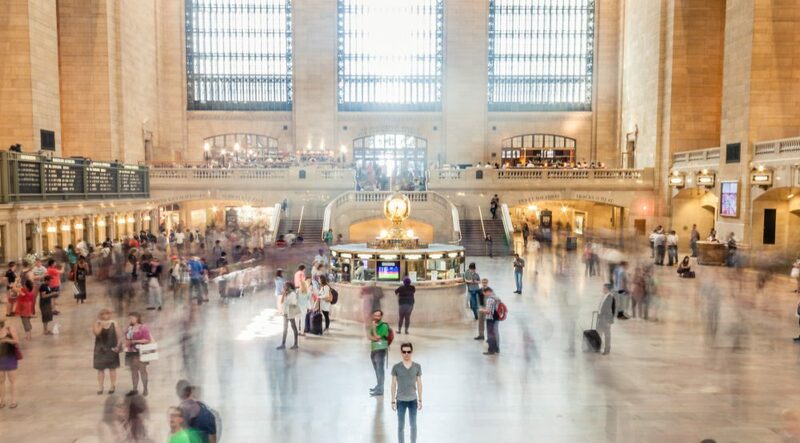 Writers are an interesting tribe of people. They often have the strangest habits. They are all unique and quirky. I’m fascinated by the stories writers tell about how they ply their trade. Consider Ralph McInerny, for instance. McInerny was a philosophy professor at University of Notre Dame for over fifty years. He emerged from academic obscurity as the writer of the famous Father Dowling mysteries, a series so engaging that it was eventually made into a television series starring Tom Bosley of Happy Days fame. He wrote other novels with different protagonists and settings, as well as numerous philosophical treatises, an adjunct of his day job. He was a prolific and multifaceted craftsman. McInerny became focused on writing in the early 1960’s. At that time, he was teaching at Notre Dame, had a large family, and had just bought a new home. As a result, he was financially overextended and needed to earn extra money to make ends meet. He’d done some writing before, selling stories to magazines, but had never taken the idea of being a writer seriously. So, facing a recurrent financial squeeze, he set himself up into an apprenticeship in writing. Each night after the children had gone to bed, he went into his basement and pecked away on a manual typewriter from 10 PM to 2 AM. Every night for a year. Though pooped after a long day, he said about going to his subterranean writing desk, “It was as if the sun came up and it was a new day. I just loved it.” He tells the story of his writer’s apprenticeship here. He did this for a year, having determined from the outset that, if he didn’t sell anything by the year’s end, he’d find a different way to moonlight. He published over fifty books before he died three years ago at age eighty. Ernest Hemingway wrote every day for six hours. Sober. His average output being about 500 words. Truman Capote always wrote reclining on a couch. Stephen King writes ten pages a day. Dan Brown rises at 4 AM and writes. Seven days a week. George Will writes his editorials with a fountain pen. Vladimir Nabokov wrote his novels on index cards. Daniel Silva writes all the first drafts of his novels in longhand on yellow legal pads in pencil. What writers inspire you in your creative tasks? What are their habits? Writers are an interesting lot of people. They often have the strangest habits. They are all unique and quirky. I’m fascinated by the stories writers tell about how they ply their trade. Writers are an interesting lot of people. They often have some of the strangest habits. They are all unique. I’m fascinated by the stories writers tell about how they ply their trade. For instance, Ralph McInerny. Dr. McInerny (philosophy professor at Notre Dame for over 50 years) wrote the famous Father Dowling mysteries. He wrote other novels in different genres. And philosophical treatises as well. McInerny really became serious about writing in the early ‘60’s. He was teaching at Notre Dame, had a large family and had just bought a new home. He was financially overextended and needed to make money to pay the bills. He’d done some writing before but had never taken it seriously. So he gave himself an apprenticeship in writing. Every night after the children had gone to bed, he went into his basement and wrote. From 10 PM to 2 AM. Every night. Though pooped after a long day, he said about going to his writing desk, “It was as if the sun came up and it was a new day. I just loved it.” His story is told here. He did this for a year and determined that if he didn’t sell anything by the year’s end, he’d find a different way to moonlight. He published over 50 books before he died last year at age 80.